Free? is a collection of short stories by various authors. Each story has been written to illustrate a different issue that relates to one of the thirty articles in the United Nations declaration of Human Rights and the stories are all quite simplistic, but nevertheless hit the nail on the head.With the new Conservative government threatening to pull the UK out of the European Convention on Human Rights, this book couldn't be more topically important. And best of all, it's aimed at teenagers and young adults, so is widely accessible and an excellent choice for parents to pick up for their children as a way of introducing them to the subject of Human Rights and their importance. Free? is amazing little collection of stories explaining the 30 Human Rights. Some funny, some serious, some close to home and others on opposite sides of the world.I chose this book because our class started speech arts, and our topic had to link with Human Rights. And since this book is ALL about human rights, I thought it would inspire me to write my speech on one of the human rights in the book.I finished this book because, occasionally, I felt like i could relate to some of the stories. And other times, I could just imagine how it must have felt to be one of those little kids, or grown adults, going through such hard times. My favorite story was by David Almond. It was about a group of guys who called themselves the Bad Lads. They were thirteen-year-old mischief makers with a leader named Joe Gillespie. Joe was tired of the stupid pranks they normally would have done, so he decided that he'd one up them by burning down Mr. Eustace's hedge. Joe wanted to teach Mr. E a lesson because he wouldn't fight in the Second World War. Then when a new boy named Klaus Vogel moves into town, he meets the leader. He would always make fun of Klaus's German accent, and make him do things he wouldn't want to do. Until one day he had enough and stood up to Joe along with another one of the Bad Lads. Of course they had a fight and Joe won, but they were free men. Something Klaus always wanted to be. I would recommend this book to anyone who would like to learn more about human rights, and that no one could take them away from us. Each of the stories in this anthology is written to illustrate a human right, with varying degrees of success. Scout's Honour is a bitter-sweet and clever parallel between one man's heroism and a small boy's crime. Searching for a Two-way Street is a chillingly plausible dystopian poem. If Only Papa Hadn't Danced tells the story of a family fleeing from political persecution in an anonymised dictatorship. School Slave reminds us that slavery does exist in modern Britain, and that education is a privilege and Klaus Vogel shows us morality through a the eyes of an immigrant who has experienced real evil.However, JoJo Learns to Dance is a poorly structured and inconsistent anthropomorphic fable. (Crows briefly have arms and travel by car, and the whole (too human) point of democracy, party politics and parliament is lost in a rather confused add-on of birds voting by species.) A similar animal-centred failure is Sarsaparilla, which trivialises the significance of naming - why a guinea-pig?The anthology is a valuable contribution to the promotion of Human Rights and several of the stories are important. Just pick and choose. There are thirty articles in the United Nations declaration of Human Rights. This books covers quite a few of them in the easy to understand style of short stories. I believe that the intended audience is for youth that don't know about the declaration, to provide some background information and a little bit of consequence. Some stories were more abstract than others. Some were obvious about the message they portrayed, others took a little longer to get to the point. But every story had something valuable to say about human rights. It took me a little while to read because I read it sporadically while reading other novels at the same time. In that sense, I like anthologies. I don't feel tied down; I can pick it up, read a few stories, and move on to something else without feeling that I am at risk of forgetting an essential plot element. Overall, it was well done. I think that it would be valuable to have in elementary schools to teach real messages in an easy way for kids to comprehend. This book is a collection of fourteen short stories about the human rights. Each story tells of how one or more human right is abused and broken. All the stories are unique in their own way.I picked this book up because the cover caught my attention and because my class was doing speeches on the human rights so I thought that this book would be interesting to read. This book wasn't as good as I thought it would be. Like some of the stories were really confusing and I didn't really understand them. My favourite story was probably the one written like a tape recording. It was hilarious when the inspector asked how the kid, Pommy, got past the ten security doors. Personally I think that the kid was guilty. There is no way he could have gotten past the doors without knowing.I finished this book because it's interesting and I enjoyed reading all the different stories. I usually don't read books like these but this one was good.I would recommend this book to Grace because I think that she'll enjoy the stories. Overall, I enjoyed the collection. As with any collection of stories, I thought that some were better than others but, overall, I think that they were strong (though, pretty overtly didactic). For early teens, I think this would be a good introduction to Human Rights, and I really like that they had a wide range of settings for the stories, demonstrating that human rights are important regardless of country or location - and that they can be violated regardless of country or location.That said, I also have no idea if I would have enjoyed this when I was in the 12-15 age range... probably not. That said, I was also a very picky reader at that age (I read only within a few select genres, and didn't like short stories as a rule of thumb). Regardless, I do think that this would be a good addition to a school library and would provide a good cross-over between L.A. and Social Studies at the junior high level. 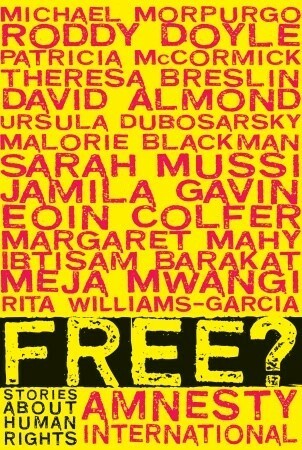 Several famous YA authors (David Almond, Patricia McCormick, Eoin Colfer to name a few) and many internationally known authors submitted stories for this unique work on human rights for Amnesty International. Using articles from the Universal Declaration of Human Rights of 1948 as their basis, each author tells a unique tale that highlights what it means to be free and how we all should have the same basic rights to live in this world. David Almond’s story about standing up in the face of a bully is simple without being over-simplified. Rita Williams-Garcia relives the aftermath of Katrina through poetry. Michael Morpurgo’s story about how one small, traumatized boy in war-torn Palestine tries to make peace in his world is poignant and sweet. Some stories are sad, some are funny (one or two are just plain weird); some highlight the plight of refugees or oppressed people in the world. This book would be great shared aloud in classrooms to spur class discussions. This book is incredible. It presents students with a simplified version of the Universal Human Rights Declaration and stories to go with some of them. While some stories are better than others - some even made me cry - each has a lesson to be learned. It has the potential to teach a lot readers about the plight of people all over the world. What I loved about the book was how it shows people that life isn't fair, and not in the way they think. My students complain that their life isn't fair because their parents didn't give them the allowance they wanted, or they didn't get the video game they've been looking foward to. But they don't realize that so many people in the world have it far worse. And worse yet, most of them don't care. I wish the book was nonfiction, but perhaps because it is fiction students will read it and possibly take away some meaning from it. Free? is a collection of short stories centered around human rights. It ranged from strange guinea pigs to beautiful kites. I thought that it was an interesting way to view conflicts, but a bit outdated. However, history is the best way to look at the present. It also helped me to understand the culture of some countries such as India and it showed how subtle some human rights violations can be. The last story was the best because it was so beautiful and realistic and I wish that photos had been taken, even though it is a work of fiction. Most stories however were sad and some were happy. They were not gory, some were funny, and the perspectives on each issue were different. Quite a few stories were about the Israel- Palestinian wall. This book was all right. There were some stories that I thought were boring and some that I thought were great. This is a very good book about human rights. It refers to the thirty articles of fundamental human rights for everyone. It contains various stories from different places and cultures that show how these rights can be abused and, sometimes, the hatred that led to the abuses overcome.There are stories dealing with slavery of children in sweat shops, a story about Katrina and how nasty the police and military were to the people, a story about a man who was a conscientious objector in World War II and a group of young boys that set fire to his hedge, and an incredibly hilarious story about a boy from Ghana who ends up getting to the Crown Jewels in England, overcomes all the advanced security, and does this only by using his marbles.Literally.There's also a wonderful story about the Palestinian/Israel border and a young boy who wants peace.Definitely a good book to read. For some reason my library didn't shelve this book as young adult and for a good three stories I was curious why it was so amateurish. Once I figured out the audience, I enjoyed it much more. Each story relates to a specific article in the Declaration of Human Rights, the better ones in a more abstract way. They range from a hilarious tale of a Ghananian boy Scout who accidentally steals the Crown Jewels in the Tower of London to the heartbreaking story of high-schoolers looking for water after Hurricane Katrina.I think this would be a good text to introduce human rights (to faith, nationality, assembly and free speech among others) to middle school students. It's approachable and often fun while still being serious enough to prompt discussion. Read: Klaus Vogel and the Bad Lads by David Almond - I was wondering if this collection of stories would be too foreign for middle students to relate to, but I was completely wrong. The first story is about a small group of boys who do small pranks around town, but never anything seriously bad. Until they are joined by a slightly older, cooler guy named Joe who leads them in increasingly hateful crimes against other people. When another new student arrives from Germany, Klaus, the boys see that Joe isn't as admirable as they thought before. Klaus says very little (partially because he doesn't speak English well yet), but what he does is powerful. This book has a collection of short stories, so this is a summary for just one of them:David, a student, was walking home when a cloth with the word "HELP" on it drifted onto the ground right in front of him. He wanted to know who wrote this and why, but he was already late to go home. So he texted his mother that he had detention so he could stay back and investigate. Then, he stumbled upon this wooden shack with people trapped inside. As he was talking to these slaves, a man, probably the slaves' master, appeared out of nowhere. David did something unexpected from a kid and saved the day. A collection of short stories based on several articles from The Universal Declaration of Human Rights. A good book for introducing the reader to the UDHR. One of the stories I kind of can relate to is Setting Words Free by Margaret Mahy. It tells that books are a great medium of communication. It bridges people from all kinds. Another stories I like is No Trumpets Needed by Michael Morpurgo. The trauma a Palestinian child receives when he saw his brothers killed by Israeli armies. But instead of bear grudges against the Israelis, he try to connect with them, and send a message of peace.Overall a decent read, reminding us that all people are born free. I know that this is a very worthy book, but as literature it left me a bit underwhelmed. Most stories were just too didactic, which of course is not a surprise, when the idea was to get writers to write about human rights, but it doesn't necessarily make for good reading. Quite liked the story by Margaret Mahy about setting words free, and also the last story by Michael Morpurgo about making kites and letting them go to fly over the wall in Israel, as a way to connect Jewish kids to Palestinian. Free? is a collection of fiction stories that are about human rights. Each one is representative of one or more of the Declaration of Universal Human Rights (United Nations). I found the book lacklustre, dull, and uninspired in lots of parts, while one or two of the short stories were interesting, heart-wrenching and well written. The reason for this is because many of them are written in a very purple prose sort of way, and that is just not what I like. The ones that I did like were the ones that were more realistic. Decent collection of short stories written by children's/YA authors. It's a mixed bag. Some stories are great, some are so-so and some I just wanted to skip. All the stories explore different forms of enslavement (literal and figurative) and freedom. Each story is followed by an Article (of declaration?) by Amnesty International. If the story is tied into historic/current events there is a paragraph with additional information.I think this would be good for a classroom because each story invites discussion. An amazing little collection of stories highlighting the 30 Human Rights that brings to light some of the plights around the world and the injustices caused by them.Some humorous, some serious, some close to home and still others on opposite sides of the globe, Free? gives beautifully written examples of each of the Human Rights from some of the top children's authors of our time.A definite must read, even for those with no interest in this type of book. 5 stars. Though written for children with some simple stories, I really enjoyed how each human right was illustrated with a story and was portrayed in memorable contexts. One particular story was about how everyone deserved the right to have a home, illustrating how anyone can become homeless. This resonated very much with me as I often see people who sleep on the sides of a station. The book spreads a good message reminding everyone that they are entitled, by law to such fundamental rights. I thought that Amnesty International's book which was compiled by several well-known authors, made the Universal Declaration of Human Rights more understandable. As a thirteen year old girl, I didn't even know what the Declaration of Human Rights was until I picked up this book. I found it very informative, and readable. The stories each made sense and highlighted an extremely important article. Free? was an interesting, touching, and wonderful book. A fascinating collection of stories, each addressing a different article from the Universal Declaration of Human Rights. Some read better than others, but they all do a great job highlighting why the declaration was created in the first place and why institutions like Amnesty International still exist to protect the rights of all human beings. Some of my favorite authors like Roddy Doyle and Eoin Colfer contributed to the book, and I am glad to say their respective stories do not disappoint. This book had a few pretty decent short stories throughout, but I don't necessarily feel like it was written for high school aged teens (which is what I was searching for). The language and content is perfect for middle schoolers and I would recommend it to those teaching at that level. I love this book! It shows the another side of human's life and makes me realize there are others living in a total polarizing environment. I strongly recommend this book to people who is interested in human rights or people who need to take a break to refresh themselves. Like Short Stories?....Go for it then :)One of the stories I kind of can relate to is Setting Words Free by Margaret Mahy. It tells that books are a great medium of communication. It bridges people from all kinds. I absolutely loved this book. I think it has a lot of great points. It makes me want to take action instead of sitting around and not doing anything to help. I highly recommend that everyone goes out and buysw a copy of this book and I think we all should take action. This book, with many various stories about real life but in fictional stories, explains how the 30 articles of human rights which everyone has may not actually be inforced. In many short stories, it shows what articles they are and explains the rules clearly. 1.I really didnt like this book because it didnt just stayed with one story it went to different ones.2.I liked that it had qoutes and little pictures to go along with the qoutes.3.And lastly that it had little poems in the book. A mixed bag, with varying degrees of success. David Almond Margaret Mahy Meja Mwangi Jamila Gavin Eoin Colfer Michael Morpurgo Theresa Breslin Sarah Mussi - David Almond is a British children's writer who has penned several novels, each one to critical acclaim. He was born and raised in Felling and Newcastle in post-industrial North East England and educated at the University of East Anglia. When he was young, he found his love of writing when some short stories of his were published in a local magazine. He started out as an author of adult fiction before finding his niche writing literature for young adults.His first children's novel, Skellig (1998), set in Newcastle, won the Whitbread Children's Novel of the Year Award and also the Carnegie Medal. His subsequent novels are: Kit's Wilderness (1999), Heaven Eyes (2000), Secret Heart (2001), The Fire Eaters (2003) and Clay (2005). His first play aimed at adolescents, Wild Girl, Wild Boy, toured in 2001 and was published in 2002. His works are highly philosophical and thus appeal to children and adults alike. Recurring themes throughout include the complex relationships between apparent opposites (such as life and death, reality and fiction, past and future); forms of education; growing up and adapting to change; the nature of 'the self'. He has been greatly influenced by the works of the English Romantic poet William Blake.He is an author often suggested on National Curriculum reading lists in the United Kingdom and has attracted the attention of academics who specialise in the study of children's literature.Almond currently lives with his family in Northumberland, England.Awards: Hans Christian Andersen Award for Writing (2010).